I know that Grisha was the Attack Titan before Eren ate him so that makes Eren the Attack Titan now... right? I'm just not sure what to call his titan form. I know in the beginning they named him the Rogue Titan, but does it change now that we know he ate the Attack Titan? Most of the fandom calls him the Rogue Titan but I know a few that call Eren's titan form the Attack Titan. So is it just majority rules or whichever one you feel like calling him? I think of Eren being called the Attack Titan is more of a title than what you should call his form... or is that the same thing? we find out that the proper name for the titan form Eren is in possession of is the Attack Titan. we do know that Eren's father, Grisha Yeager, consumed the Founding Titan thus combining two titan forms into one. Once Grisha reached the 13-year limit, he forced his son to consume him so that his titan-shifting abilities would pass on to his son. That being said, even though Eren is technically in possession of both the Founding Titan and Attack Titan forms, he is still referred to as the Attack Titan. it was not a form they were referring to but rather an alignment. 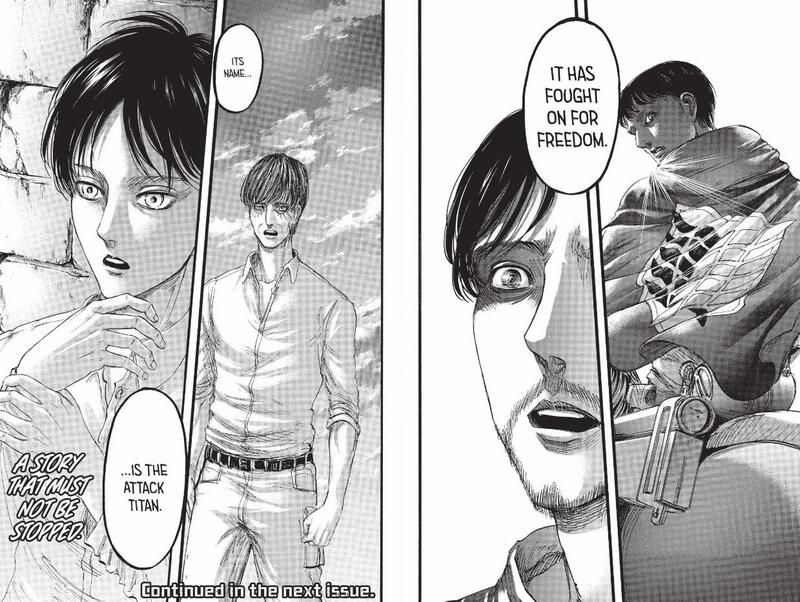 Eren's titan, unlike the other titan-shifters, was aligned with the Eldians on Paradis Island and not with the titan-shifters waging war against them. Think of the temporary name as a way that the Eldians initially distinguished the Attack Titan from the other titan-shifters. Once the Eldians learned the actual name of Eren's titan form, they stopped using Rogue Titan as a descriptor and used Attack Titan instead. was used only as a means to describe Eren's titan when the Eldians did not know the actual name of Eren's titan form. I would say they call him the attack titan or the coordinate.Realistically speaking all titan shifters shown within the show turn out to have been at risk of getting eaten according to the manga.In the anime when the female titan first got captured it took advantage of that.It roared to attract titans, and used the smoke from them eating her body and the titans dieing to escape.Not to mention when she appeared from the right titans attacked the scouts as well.likely following her until they decided to eat the humans.The same thing happened when erwin leads the titans into the armored titan.